SkyTrax has rated the world’s airlines with strong showings from Asia. After Singapore’s Changi Airport was named the world’s best transport hub in April, perhaps it should not come as a surprise that the Lion City’s homegrown Singapore Airlines has been rated Asia’s best airline, and the world’s third-best for the second consecutive year. Dubai-based Emirates airline claimed the top prize, jumping from no. 8 last year, followed by last year’s top-ranked Qatar Airways, which slipped a spot to second place. Two months after releasing its World Airport Awards, British aviation research and consulting firm SkyTrax has unveiled its World Airline Awards, described as “the most prestigious and respected quality recognition for today’s world airline industry.” The awards are based on 18.2 million customer surveys completed over the past ten months by airline passengers of more than 100 nationalities from more than 160 countries. Once again, passengers have spoken and heaped praise on a number of Asia-Pacific flight carriers. Besides Singapore Airlines, other Asia-Pacific airlines in the top ten include Japan’s ANA All Nippon Airways (no. 4), the South Korean Asiana Airlines (no. 5), Hong Kong’s Cathay Pacific Airways (no. 6), Garuda Indonesia (no. 8), breaking into the top ten for the first time; and Qantas Airways (no. 10) of Australia. The full list can be seen here. While these results are the overall placements for the region’s flight carriers, the awards are broken into various categories, weighing in on everything from best inflight entertainment – Singapore came in second on this one – to the world’s Best Low-Cost Airline, won by AirAsia. Other wins for the region include Dragonair’s place as the World’s Best Regional Airline and ANA All Nippon Airways claiming prizes for the World’s Best Airline for Airport Services and Best Aircraft Cabin Cleanliness, a new award this year. It’s worth noting that Asian airlines nearly had a clean sweep in the category of best cabin staff, claiming nine of the top ten places in the category that rated flight attendants. Cathay Pacific claimed first place in this category, followed by Asiana Airlines (no. 2), Malaysia Airlines (no. 3), EVA Airways (Taiwan, no. 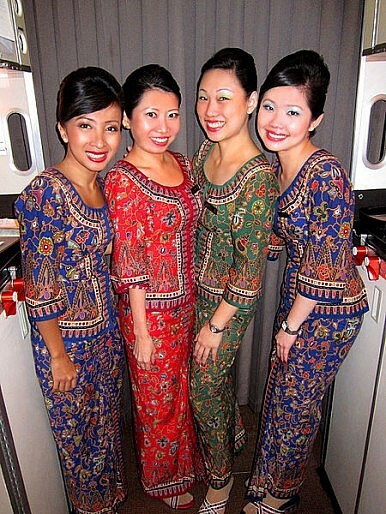 4), Singapore Airlines (no. 5), ANA All Nippon Airways (no. 6), Garuda Indonesia (no. 7), Hainan Airlines (China, no. 9) and Thai Airways (no. 10).